Subject to correction, the product was first added on 2018-09-14 18:06:40 and the last date we have for this product is 2018-09-25 12:43:19, where the last unit was sold for R 5930, which may have been a final clearance price. Seagate ST10000VN0004 10000gb/10Tb NAS hdd (IronWolf), designed for multi-bay NAS systems with Dual-Plane balance + NASWorks error recovery control, SATA3(6Gb/s), 256mb cache, 5900rpm, sustained data rate - 210mb/sec Copyright © 2019 ComXpert International CC - COPYING IS ONLY ALLOWED FOR THE PURPOSE OF SENDING US ENQUIRIES. E&OE. The best price and guaranteed service and backup from official computer suppliers in South Africa for the ST10000VN0004 Seagate IronWolf 10000gb/10Tb SATA3(6Gb/s) 256mb cache NAS Hard Drive. Find related ST10000VN0004 Seagate IronWolf 10000gb/10Tb SATA3(6Gb/s) 256mb cache NAS Hard Drive products in our NAS - Hard drives for NAS servers Category for even more options. 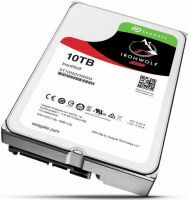 Read reviews and find out about ST10000VN0004 Seagate IronWolf 10000gb/10Tb SATA3(6Gb/s) 256mb cache NAS Hard Drive. Discounts, specials and cheap prices only at ComX Computers.